Designed by OSW-Open Source Workshop for the 2014 Milan Design Week, HELIX is a diffuse furniture system that generates a continuous interior space by adapting simultaneously to any vertical and horizontal surface while defining an immersive spatial atmosphere. 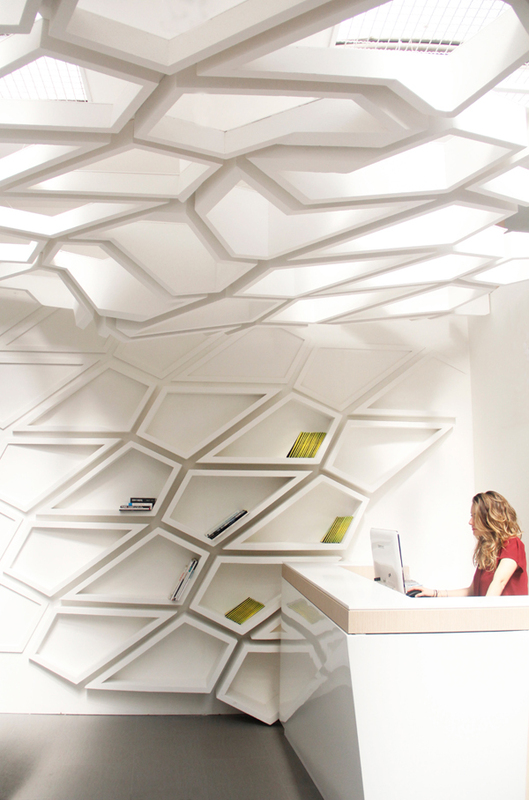 Its form recalls a natural system that emerges from the structure beneath. 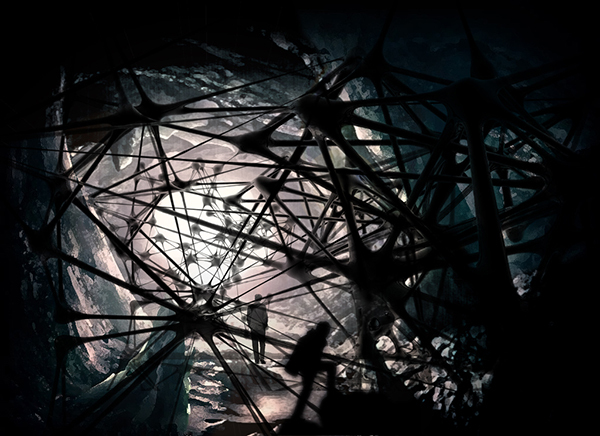 HELIX is modular and can be aggregated in different forms following the logic of spatial branching and growth. It can be placed in any private domestic space or in public indoor contexts. The modules can vary in size, color, use, and orientation. 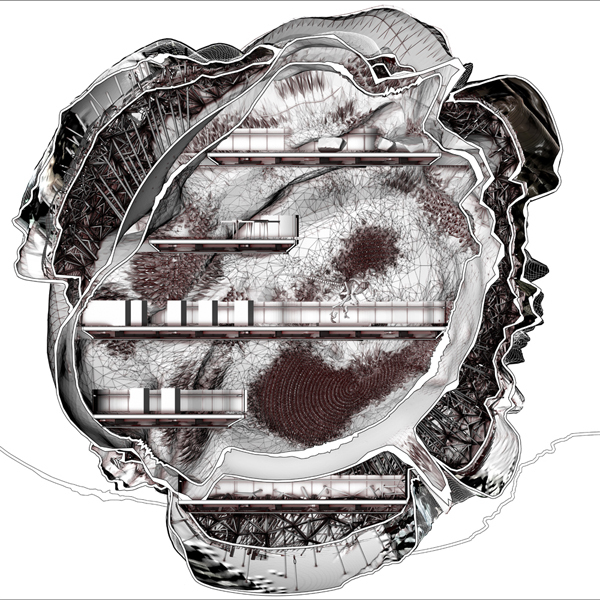 The system morphs the space allowing the viewer to follow the visual continuous trajectory generated by the wrapper. This project tackles the status of the icon in Architecture as they can pop up anywhere. The role of icon when thought of in a non-architectural sense can be related to icons in a logo sense which is a representation blurb of a company, application, commands, signs, etc. 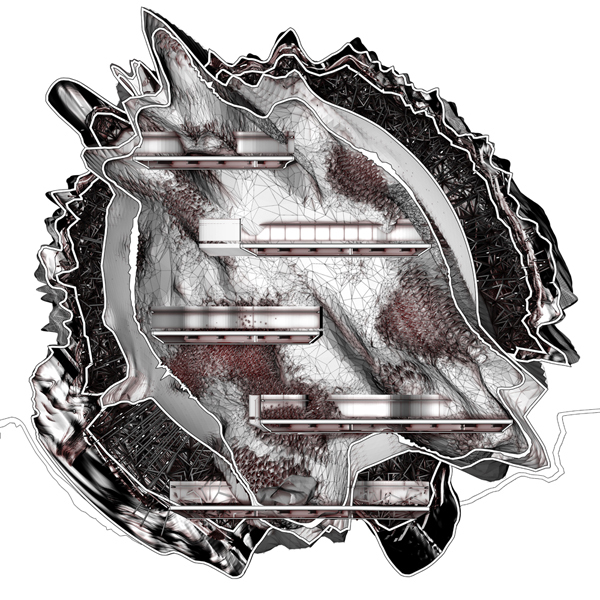 So to make the icon itself the project uses a means of graphic representation to distinguish itself from the context. Icons in a buildings sense may or may not have a relationship to its context in any sense form, space, material, etc. What all icons have in common is anyone of any culture who visits a city or place automatically know where they want to go when they visit that place, such as the Colosseum in Rome, the Disney Concert Hall in Los Angeles and so on. The representation means was used to make something that could be distinguished by any culture. The forms, the massing, and the colors were all appropriated from the Pop Art and Super Flat Movement, the surface (window) projection follows the rules of the 4 square grid in pop art but without division between the varying colors. And the false window figures wrap the massing new facial expressions are formed as the figure becomes distorted. The idea was to create something relatively familiar by any culture but to not be tied to any at the same time. The project interacts with two other massing on the site who’s forms and surfaces derive from fashion influences, and the cubist movement. Collectively this project does not strive to relate to its context in a physical sense but rather a cultural sense where Art and Architecture are collapsed into one. 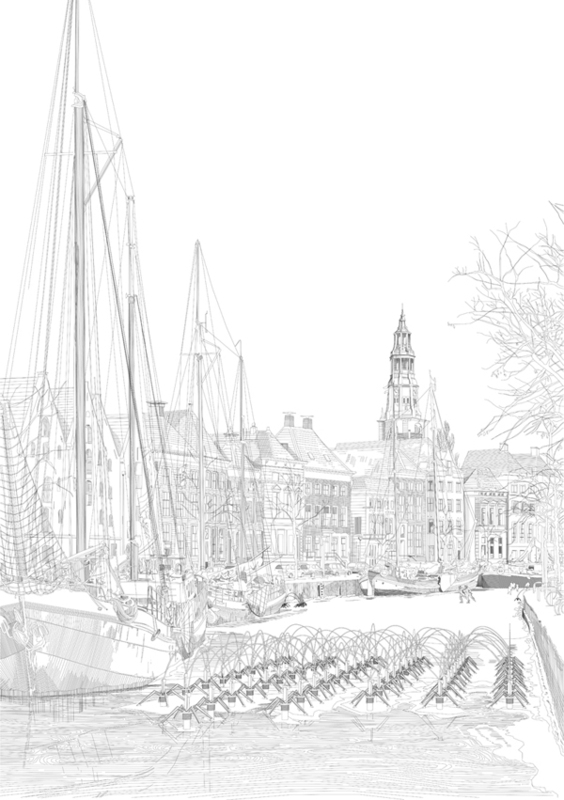 Johan Voordouw and Aisha Sawatsky have completed 12 digital etchings currently exhibited at the Rotterdam Kunsthal for IABR 2014 “Urban by Nature” biennale. Each etching contains a folly that articulates a specific weather condition. 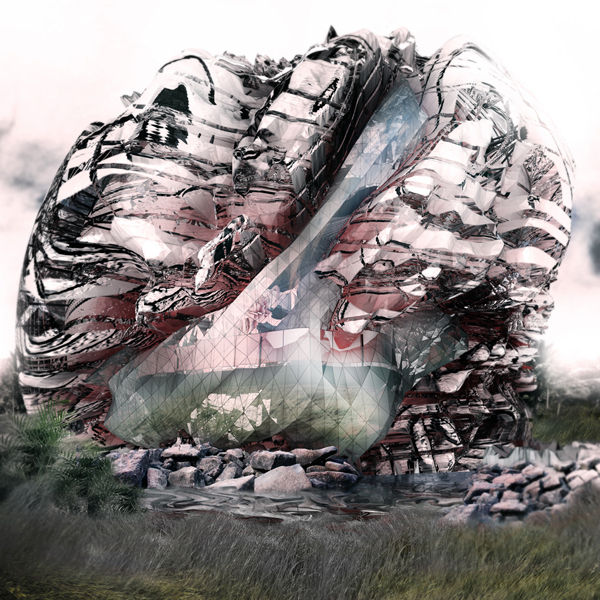 The project explores how shifts in climatic patterns will have a resultant cultural affect. Each of the twelve drawings expresses a weather condition, an activity, a different month and one of the Netherland’s twelve provinces. Therefore, the project is a reflection of the country as a whole, geographically, culturally, and with the passing of the seasons. 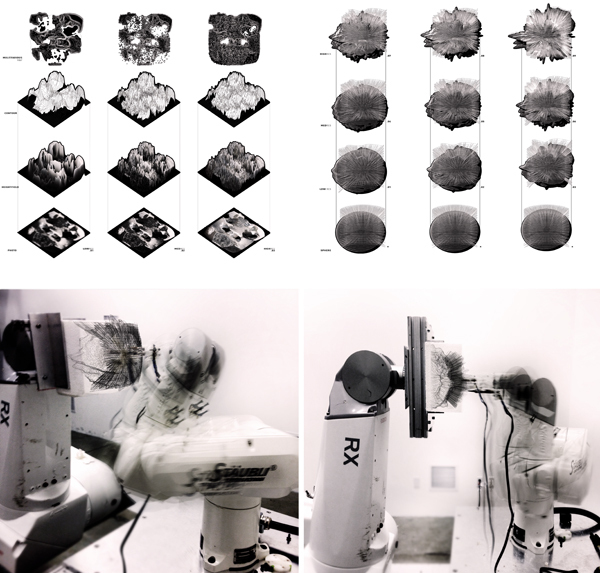 Multifarious formations is is a set of ongoing experiments in fabrication and modelling done by Daniel Caven, at the Southern California Institute of Architecture Robotics lab. 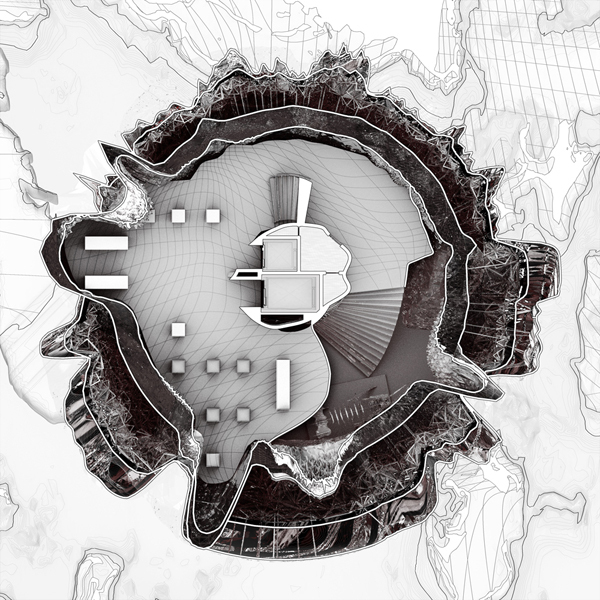 The research constructed takes on the dilemmas of computer based modeling- and its lack of understanding of material agency within simulation and transformation.The idealistic setup for architecture, fabrication, and simulation is to have a real time feedback loops allowing the designer/machine to update according to gesture and errors in simulation. This allows for fabrication to have a customization and idealism to the processes. Using scanning methods and data analysis in the digital world the project is going to take on the idea of smart tooling. Tactics in fabrications have been based on patterns and dialogs upon G code generation limiting uniqueness to a manufacturing process. Using paths in the milling process gives a diminishing value in design and a declining appreciation for uniqueness in design. Advanced fabrication in the research and experimentation takes on new ways of producing objects each unique to one another. 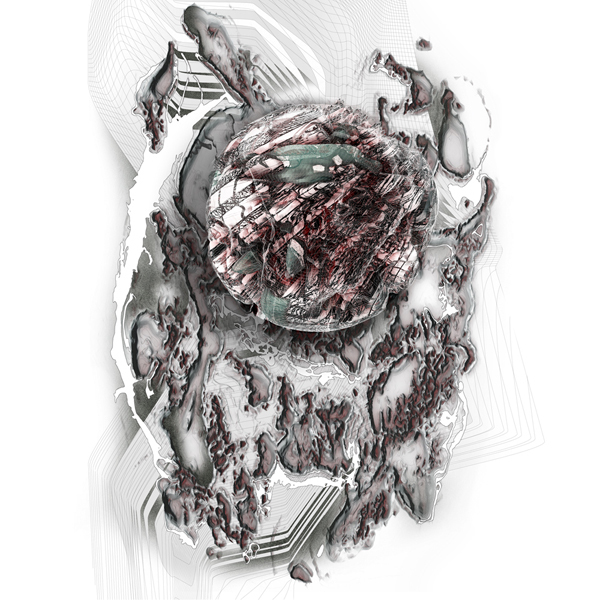 Image based drawing sets that change in resolution parameters allows for robotics to take on true free form fabrication. Image based manufacturing gives the result of the object at different resolutions and sets up new ways of making through single object displacement maps. Using this technique in its beta stage this research is able to create many different variations of the same object and a real time loop by bring the object back into the computer to show end results. 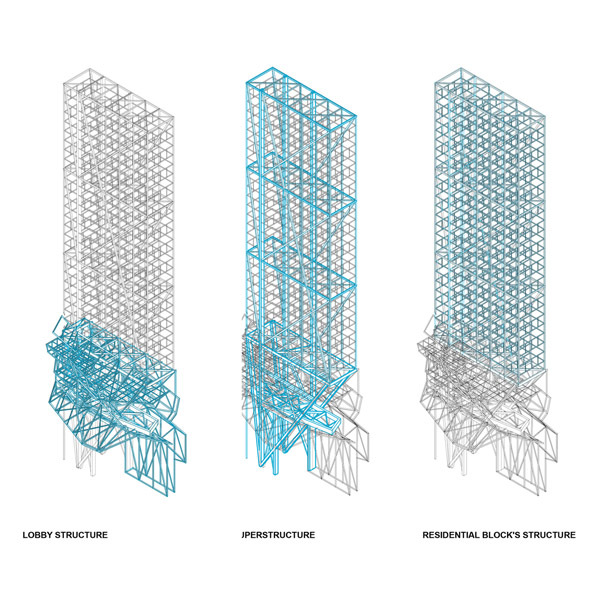 Architecturally it deals with a precise imprecise way of developing analog modeling and digital feedback loops. Height Field maps are used as tool paths for building and forming objects that are then encased in resin and then removed my acid washes. 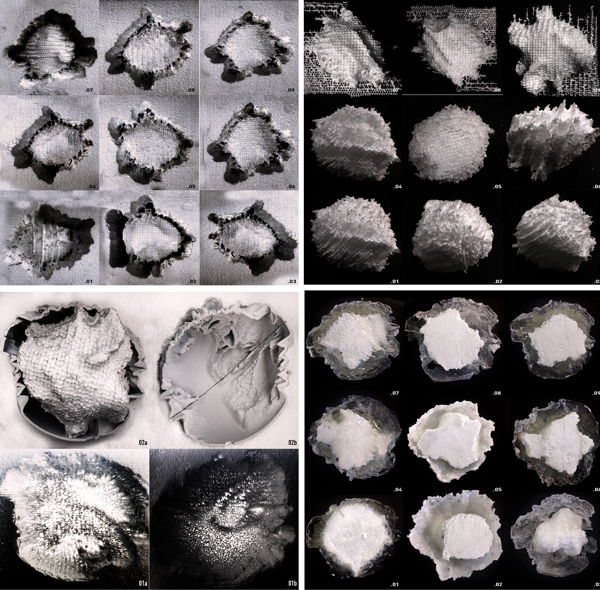 Multifarious Formations seeks to combine methods of computer based modeling and analog modeling. 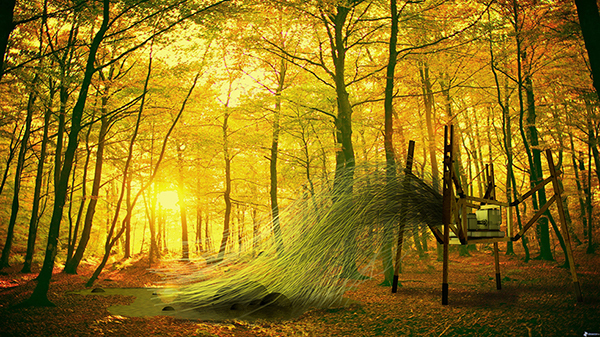 The research seeks to create a platform for freeform fabrication and real time feedback. In order to attack multiple problems of tooling, perform, shaping forces, and material intelligence. 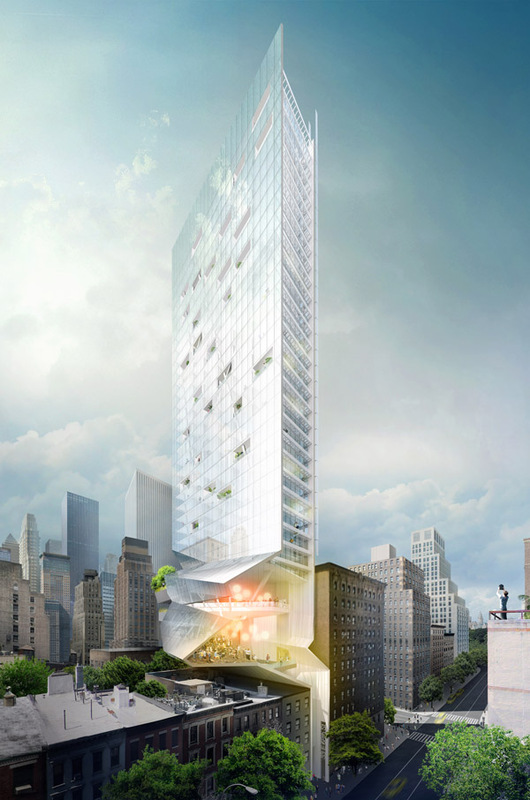 Attacking the conventional residential tower model, characterized by anonymity and isolation, this building provides a living experience that would match social and urban dynamics of New York tomorrow. Cities are slow to adapt to the revolutionary technological changes that have occurred in the last 10 years, which have resulted in the ever increasing levels of digital, and crucially physical interaction. 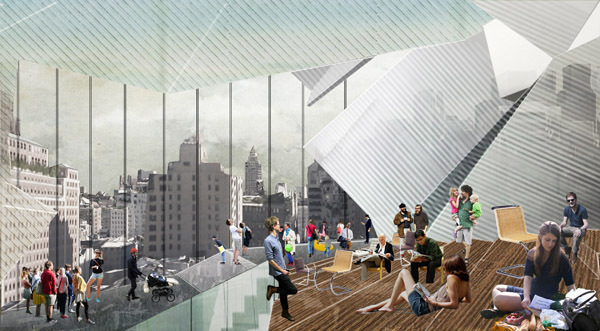 These changes manifest in this design through the magnificent lobby space open to the city, which could be used as a co-working area, an auditorium, etc. It transforms the whole experience of being in a residential tower, fostering communal well being. The soaring land prices pose a threat to the competitiveness of New York. It is crucial for the city to retain its ability to attract people. 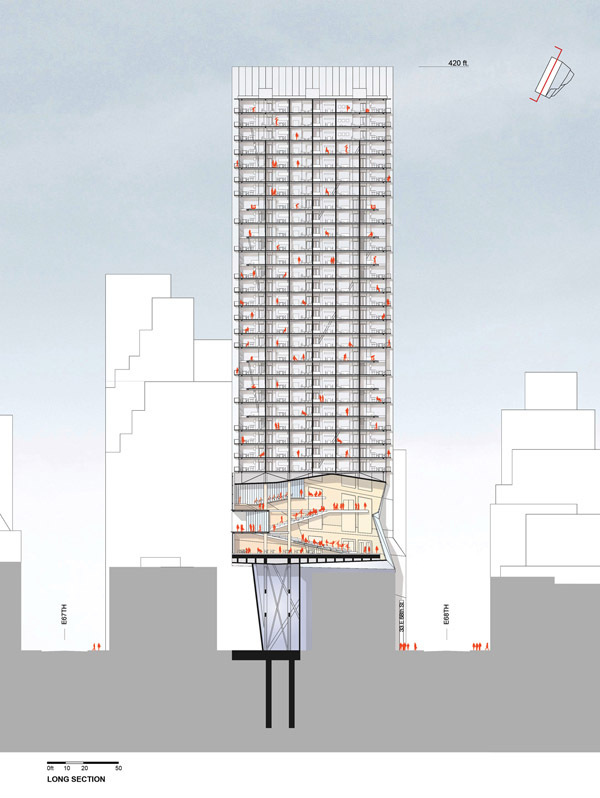 To address this the tower stems from an impossible site of 8ft by 70ft, on the corner of E68th street and Madison avenue, yielding housing close to work in the Midtown for hundreds of people. The new Florida Polytechnic University – whose 170 acre campus and iconic central building were designed by architect Santiago Calatrava – will formally mark its opening on August 16 with a ceremony at the campus in Lakeland, Florida. The university is Florida’s 12th and newest member of the State University System and will welcome its first students later this month. The main building – the Innovation, Science, and Technology Building – has been finished on schedule and under the $60 million budget. Located on the north side of the central lake it is designed around, the exterior of the 200,000 sq. ft. building is made up of aluminum, aluminum cladding, concrete and glass. The interior is made of concrete flooring and columns, plaster, steel and glass. It will function as the primary campus facility – housing classrooms, laboratories, offices, meeting spaces and even an amphitheater for larger events. On the second floor, offices and meeting rooms are arranged around the “Commons” – a large meeting space under the vaulted skylight. The building has a pergola of lightweight aluminum trellis wrapping its exterior. The pergola not only adds character, but reduces the solar load on the building by 30%. 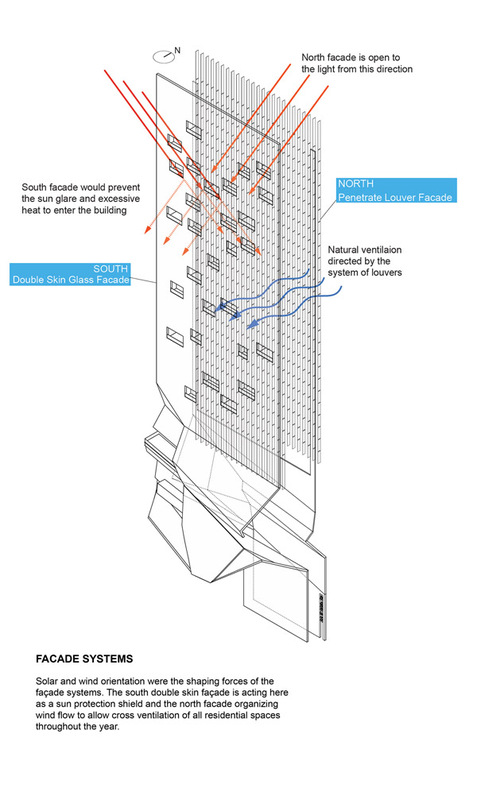 It also has an operable roof, made of two sets of 46 aluminum louvers, which use the power of hydraulic pistons to move in relationship to the sun, and which can be fitted with solar panels. The operable roof helps to shade the skylight of the Commons from direct sunlight and to maximize daylight to the space. Visible from the adjacent Interstate 4, the futuristic building has become a well-known feature in the local area and has already appeared in an ad campaign for a major automobile manufacturer, who used it as a backdrop for its commercial. 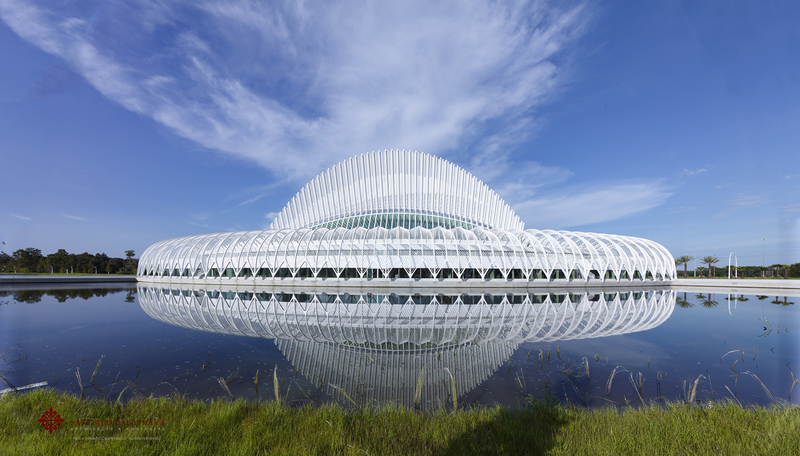 When designing the campus’ master plan, Calatrava made the most of the unique topography of the central Florida area. The campus lake offers dramatic views and serves as the primary storm water retention facility and as a storage vessel for site irrigation. The campus is connected by a series of pedestrian causeways and walkways, as well as a road circling the lake buffered by trees and greenery. 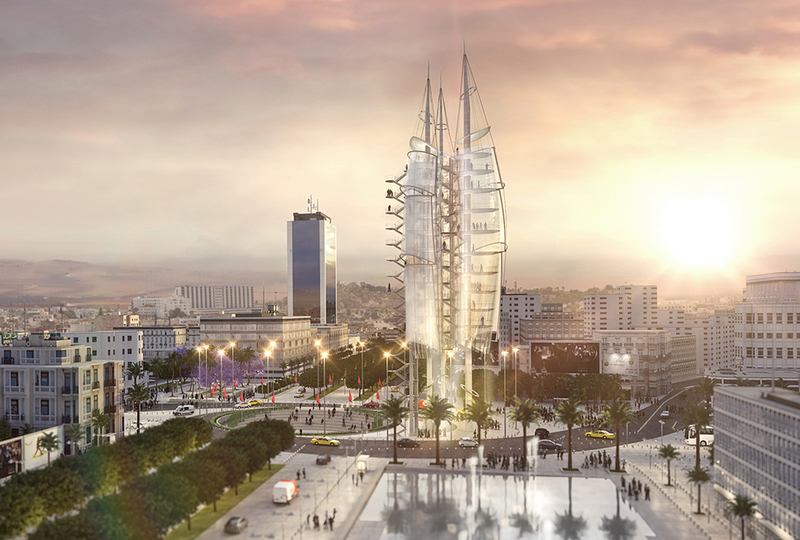 Initiated by the foundation Symboles, the project is situated at the intersection of two main axes in central Tunis. The project includes the redesign of the Square of 14 Janvier and its surroundings as well as the construction of the World Social Center (WSC) Tower. This project reflects the political will to express the ideological and social changes brought about by the Tunisian revolution that took place between December and January 2011. Supported by competent political authorities, the project was managed within the foundation Symboles by the innovation adviser of Tunisian President Monsef Marzouki and monitored by his cultural adviser. 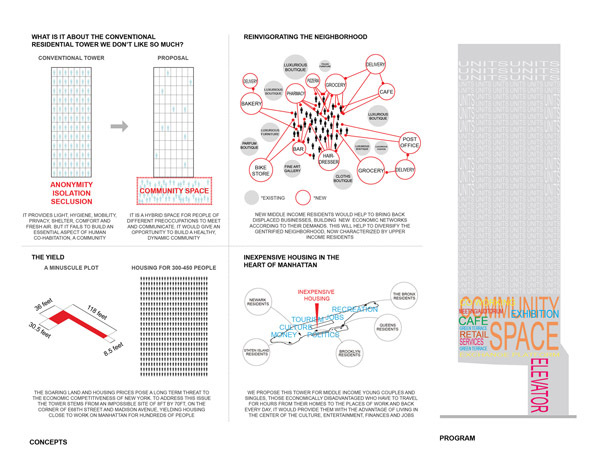 As an unprecedented project in the Arab world, the complex proposes a new vision for public space in the heart of the Tunisian capital by creating different types of civic space that are associated with multiple democratic practices. For example: the People’s Agora at the center of the Square of 14 Janvier, renamed as the « Square of the People »; the Promenade of the People, with fountains dedicated to the martyrs of the revolution; the Garden of Liberty and the Garden of Delights; and the WSC tower which is houses spaces dedicated to social, economic, and artistic innovation. The project’s design process reflects and embodies the hopes and possibilities brought about by the revolution as well as their social, economic, cultural, artistic, architectural, and urban implications. For some time now there has been a plan to design a museum of oil in Italy . The site of Vallezza , starting from the first drilling in 1905 , has established itself as a strategic center for the extraction of hydrocarbons in Italy; it has played a very important role during the two world wars of the first half of 900; his unique yellow oil , with natural characteristics similar to those of an already refined product, was pumped directly from the reservoir to the tanks of vehicles. The story of hydrocarbons, although still short in the context of human history, today is one of the events that have most influenced and changed our way of life and the planet itself. From the seventies to today, the extraction of hydrocarbons has not undergone substantial technological evolution; activity is concentrated in research and oil processing in consumer products and especially energy. I guess, in the composite and sometimes crumbling reality of Vallezza , a story that can go beyond the simple narrative of the time of the hydrocarbons and their exploitation : a kind of purification and redemption; I do not intend to represent, in this place, a present that is visible to all, but a now -too-distant past that belongs to history, and a growing story for the future; from here the idea of conversion, re-appropriation by the nature of a land transformed by humans and a future full integration between man, technology and nature. Fab-Housing is the Master’s degree project presented by Eugenio Aglietti, Luca Beltrame and Jessica Tiberi for the final thesis of IN/ARCH Post-graduate Master Course ‘Expert Designer in Emerging Technologies’. The proposal concerns the requalification of Caserma Ruffo area in Rome and aims to give a different interpretation of Social Housing, adding a connotation related with work and productivity. 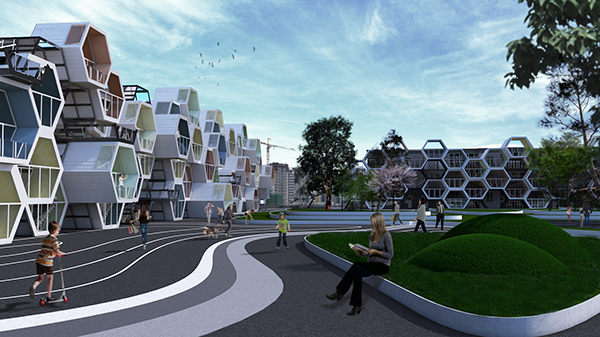 The main buildings redevelopment is arranged as new facades consisting in walkways and honeycomb-like productive residences. The system of new hexagonal cells, co-working spaces and buildings’ new loft, contribute to create a productive community in which each habitant can provide a specific service. In this way Fab Housing community is able to cover several functions like small shops, laboratories, professional activities, gyms, offices, small art galleries and craft shops. Man’s obsession with grandeur and indulgent creations has led to iconic absurdity. We are the generation that will suffer at the hands of the creators of a wasteful era. These icons must and therefore shall fall.